Robert Hartmann meets with his tutor, Sandy DeLuck, at the public library in Winterport, Maine. Hartmann reads at about a first-grade level. Meredith Eaton, program manager with Literacy Volunteers of Bangor, matches students and tutors based on goals and personality. Eaton says the stigma of low literacy can be paralyzing. Cindy Duell dropped out of high school in 10th grade. 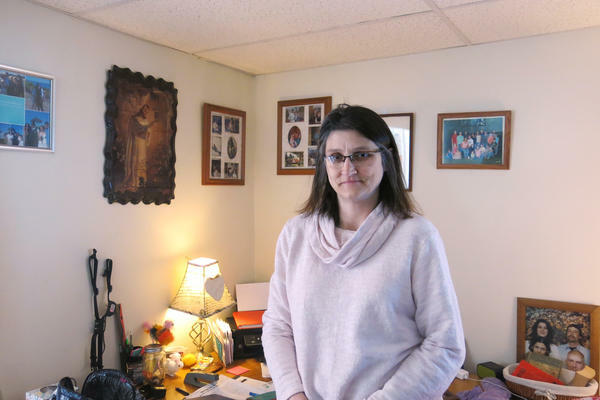 With a lot of memorization, she earned her high school diploma through adult education in 1991, and she got certified as a nursing assistant in May 2002. 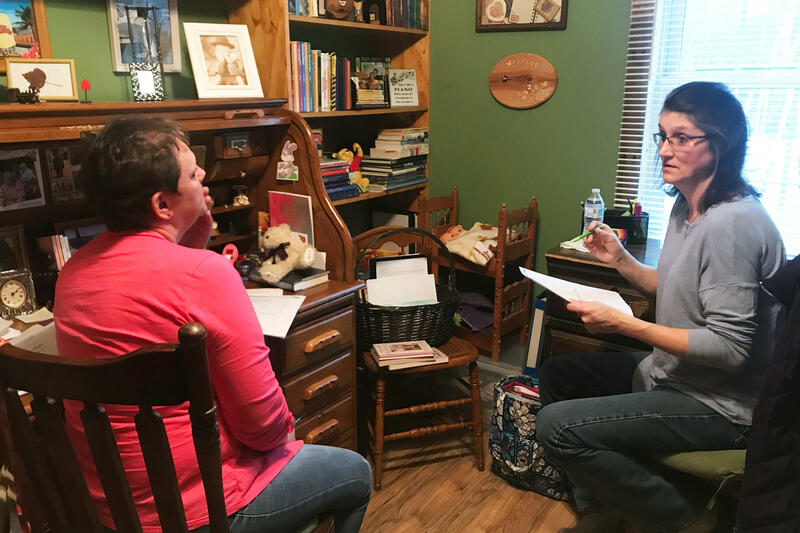 A determined student, Cindy Duell (right) meets with tutor Clair Levesque for three hours each week and spends several hours on homework each day. Mary Lyon, executive director of Literacy Volunteers of Bangor, says that her own family history led her to this work and that she knows firsthand about some of the hurdles her students face. Cindy Duell keeps a shelf of "wish books" that she hopes to be able to read one day. Hartmann is burly, with five facial piercings, his arms inked with tattoos. This is his second session with DeLuck. He reads at about a first-grade level. He is one of the 35 million U.S. adults whose reading skills are below a fourth-grade level. Thirty-five million — or 1 in 6 U.S. adults. Nationwide, adult illiteracy has proved an intractable problem, linked to stubborn societal issues such as poverty and failing schools. In fact, US adult literacy rates are no better than they were 25 years ago. 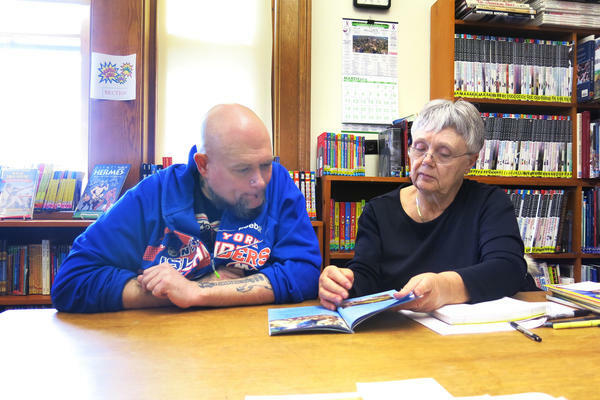 In Maine, the small nonprofit Literacy Volunteers of Bangor is among the programs trying to chip away at that daunting statistic by helping people like Hartmann improve their literacy — and, eventually, their lives. The group — – a member organization with the national nonprofit ProLiteracy — serves several hundred students a year with free one-on-one tutoring, and there is nearly always a waiting list. The program serves a mostly white, working-class community in and around Bangor. In the U.S., most adults with low literacy are native-born English speakers and, of those, most are white. Founded in 1969, the program welcomed a Maine woodcutter as its first student: Wilfred Levesque, who had never learned to read or write growing up and signed his name with an X. In retirement, he had reached his goal: to read the Bangor Daily News. For Hartmann, school was a nightmare. He has learning disabilities and always struggled with basic reading and math. But he was passed through from grade to grade, and he did manage to graduate from high school. Hartmann went on to manual labor jobs in mills and factories around Maine. "I'm a mill rat," he says. "I had jobs that nobody would want." With a range of physical and mental health issues, he is now unemployed, and in order to keep his government benefits, he is required to take literacy classes. Hartmann says he has another motivation: He would like to be able to read to his young children. And he wishes he didn't always have to ask his wife, Jessica, for spelling help. "I feel embarrassed," he says. Meredith Eaton, program manager of Literacy Volunteers of Bangor, clearly remembers when Hartmann walked in the door. Just filling out the application to sign up for tutoring was overwhelming for him, Eaton recalls: "I handed him the pen and he wrote his name, his address and phone number, and then he put the pen down and that was it for him. That was all he could get through." So Eaton filled out the rest for him. In one section, when she asked Hartmann what might keep him from his tutoring, he told her, "I don't believe I can learn." Eaton hears this often from students; the shame of low literacy runs deep. "If they were made to feel like they could not learn or they were stupid — unfortunately, people have honestly been told this, and it breaks my heart," Eaton says. That is a message Cindy Duell, who is in her early 50s, heard all the time, both at home and in school. "After you tell somebody so long that [they're] dumb, they believe it. [They] stop trying," she says. Like Hartmann, Duell has learning disabilities that have stymied her efforts to read and spell. When she was about 12, she remembers asking her sisters, "How do you spell 'a'?" "They thought I was joking," she recalls. "I said, 'No, seriously. How do you spell it?' "
"They picked on me a lot after that," she says. "It was really devastating. And then come to find out that it's 'a.' "
Despite her learning deficits, as long as Duell showed up in class, she was also passed along from year to year. That is, until she got pregnant in 10th grade. "I was told that pregnant women didn't belong in school, by my principal," she says. "So then I said, 'OK, here's your books. See ya later. ' "
Because reading was such a struggle, many parts of Duell's daily life proved a challenge, from reading road signs to following a recipe. But she figured out ways to compensate. With a lot of memorization, she earned her high school diploma through adult education in 1991, and she got certified as a nursing assistant in May 2002. She came up with other strategies. For example, when her sons were young, she would fake it; she would open a kids' book but make up stories. In her hospital job, she would swap tasks with colleagues. She would lift and wash the patients, if her co-workers would fill out her paperwork. And she relied heavily on her husband, Lee, for help, until he finally persuaded her to call and sign up for tutoring. 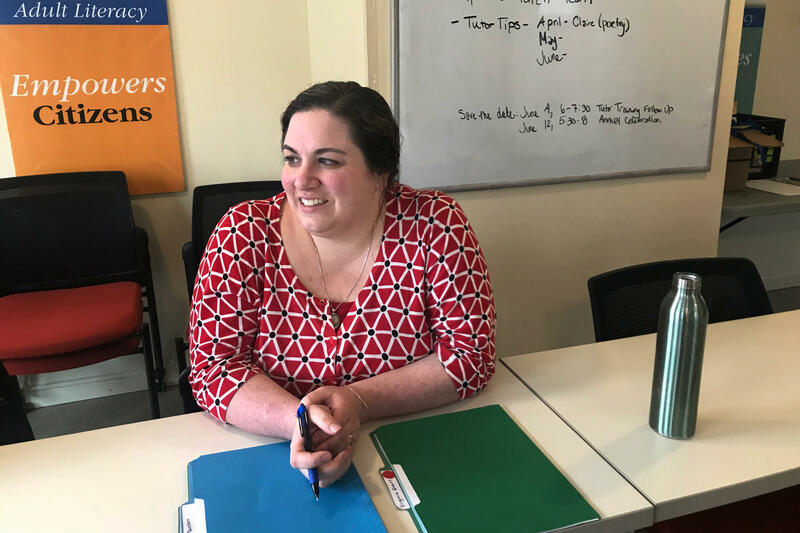 For the past year and a half, Duell has been working one on one with tutor Claire Levesque, who spent years teaching adult education. When Levesque told Duell straightaway, "I do not use red ink," her student knew they were off to a good start. "It was awesome," Duell says, " 'cause [otherwise] you look at your paper and you've got nothin' but red, all these red things, wrong, wrong, wrong, wrong, wrong." "I use purple," Levesque says. The two women share the easy rapport of old friends, joking and laughing as they get to work. Literacy Volunteers of Bangor tries to find compatible matches so the tutor and tutee will develop a strong working relationship, and the students will have greater incentive to stick with the program. These tutoring sessions aren't just about mastering phonics and parts of speech. The idea is to build skills that might help adults get a better job or become more self-sufficient. And on the day we visit, Duell is bursting with news. "I went and filled out an application all by myself to get a new car," she tells her tutor. "Perfect," Levesque says. "When was the last time you did that?" "I've never done that," Duell says. "Lee's always done it. I said, 'I'm gonna do it this time. You just sit back. If I mess up, you'll be there.' "
"And how did that make you feel?" Levesque asks. "Feels awesome," Duell says, and she laughs as she describes her husband's reaction: "He's like, 'You're gettin' too independent.' I'm like, 'Chill! I ain't goin' anywhere.' "
Duell meets with Levesque for three hours each week. She is a determined student. She figures she spends several hours on homework each day and carries a tote bag heavy with books, journals and binders of her work. The topic of one of her recent assignments: Write about something you never told anyone. Duell's essay, written in pencil in a lopsided cursive, begins this way: "I never told anyone I could not read, write or spell. It's been my secret for 51 years. I have never told my sons. I didn't want to disappoint them." Literacy Volunteers of Bangor is always looking for more tutors, both for basic literacy and to teach English as a second language. The program's executive director, Mary Lyon, has seen some tutors sign up with hopes of correcting the past. "They'll say things like, 'I was a teacher, and I know I missed the person in the back of the class. I can still see his face, and I'm haunted by him, and I'm here to reach him today.' "
Lyon says her own family history led her to this work. Her grandfather was illiterate. He was born in a log cabin in a French-Canadian community on the Maine border. French was his primary language, but he couldn't read or write in his native tongue. "He learned to speak English and read in English with my mother sitting on his lap," Lyon says. "They would read the Bangor daily newspaper together, and he'd say, 'Point to the words, and read them out loud for me.' And that's how he learned to read." That lesson has stayed with her. 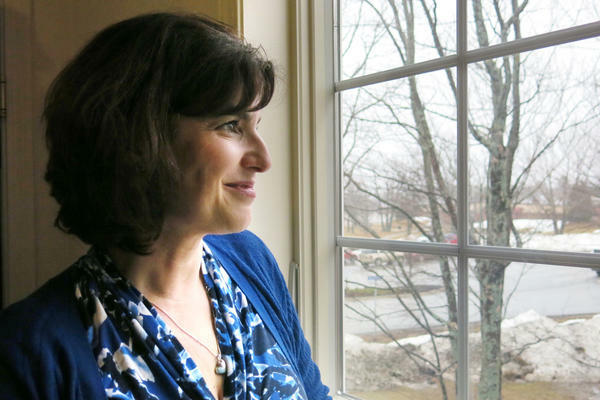 She also knows firsthand about some of the hurdles her students face. When Lyon was a college freshman, she got pregnant. A single mom at age 20, she was able to complete college and get her master's degree, but it wasn't easy. "I had to live in subsidized housing," she says. "I had to receive welfare benefits and food stamps and be humbled by that process, and have people assume that I was one of 'those' people. And I never forgot it. There was a shame factor that I wanted to be able to help others to escape." Like many adult literacy programs, Literacy Volunteers of Bangor gets no government funding but relies on grants and private donations. Their annual budget? About $133,000, with three paid staff. When Lyon makes her pitch to donors, they sometimes will ask her for metrics: "How much have students' scores improved?" or "What grade levels have they reached?" "So we can say, 'All right. We could do that for you. But instead, this is what we're able to provide: This number of people got a better job. This number of people voted for the first time. These are people who are now actively engaged in their child's education. I can give you a grade or we can talk about life.' And they're like, 'No, this is great. This makes sense. " It makes great sense to Duell, too, who has seen her life open up through tutoring. "It's like coming out," she says. "Like, 'Oh my God, I actually can read. I can spell words, I'm not dumb.' I just needed somebody that could listen and want to help me. It's like opening up a Christmas present every day. It's just awesome." Every day at her home in Glenburn, Maine, Duell reads out loud to her rescue pets – four cats and three dogs – gathered around her. She is catching up on books she missed out on growing up, such as The Diary of a Young Girl by Anne Frank and John Steinbeck's Of Mice and Men. "I loved that," she says. "That took me awhile." 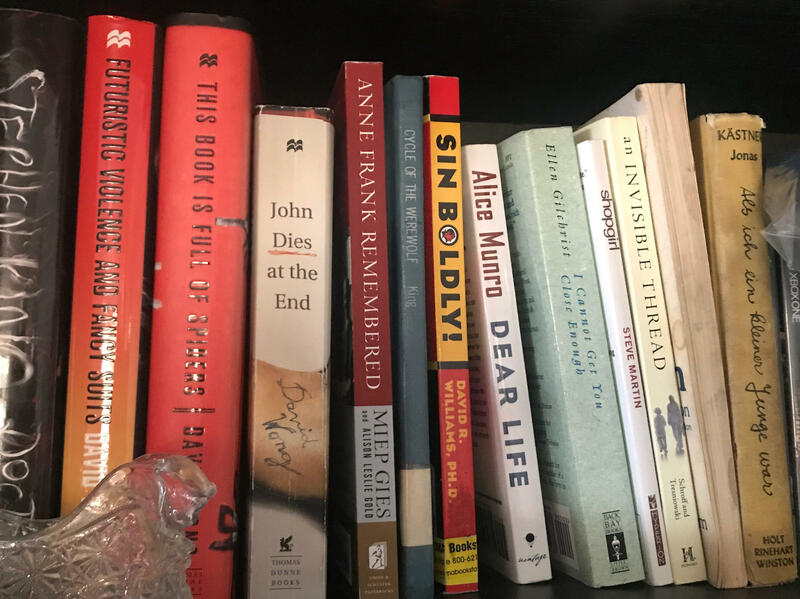 In a corner of her living room, Duell has shelves lined with lots more books: Stephen King. Sue Miller. Alice Munro. "Those are wish books," she says. "I'm working up to them." Sometimes that prospect can feel overwhelming, but, she says, "I know that there'll be a day that I'll have all those books read." She pauses for a moment to think about that, and then she says it again, with conviction: "There will be a day." (SOUNDBITE OF PERFUME GENIUS' "LEARNING") Transcript provided by NPR, Copyright NPR.